The Mayor just announced the trash collection will be suspended tomorrow and Friday. Next week, trash collection will return to a regular weekly schedule, despite the President’s Day holiday. More detail is at https://twitter.com/PhilaStreets. Do you disagree with your properties new assesed value? Please join NKCDC, Councilman Squilla, Deputy Mayor of Transportation and Utilities Rina Cutler, Streets Commissioner Clarena Tolson and partners Little Baby’s Ice Cream and PostGreen in a parklet celebration on Friday October 5th beginning at 5:30pm. After the celebration, be sure to check out all the First Friday happenings in the area. 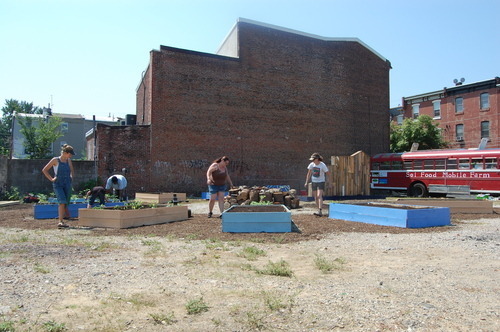 NKCDC is excited to announce the first parklet on Frankford Ave Arts Corridor. This structure can be found in front of Little Baby’s Ice Cream at 2311 Frankford Avenue and offers a seating/lounge area and four vertical bike racks within only one parking space.This parklet is open to the public and provides an economical solution to the desire for public gathering space while also offering bike parking. NKCDC worked with Little Baby’s Ice Cream to create the parklet concept, and designed the structure with input from the community and Streets Department. PostGreen partnered to take the design from the paper to the ground by overseeing the construction/build phase. Funding for the parklet comes from the Mayor’s Office of Transportation and Utilities. In the spring NKCDC and Little Baby’s Ice Cream applied to MOTU for a $5000 grant to construct the parklet. Little Baby’s Ice Cream and PostGreen offered additional in-kind services to make the parklet possible. Here are some photographs by PostGreen of the parklet in progress! Little Berlin’s recently developed project known as “The Fairgrounds” has had two major additions. House, “…a memorial sculpture that spawned from using reclaimed wood from homes and construction areas as a reminder of the current housing crisis…” by Jaime Alvarez and Vale Bruck, was installed for the July First Friday. After this installation was complete, Sol Food Mobile Farm built a community garden with the help of Little Berlin and some local kids. These efforts are known as The Fairgrounds Project which is making fast progress toward turning this lot into a pleasant public space. Sol Food Mobile Farm, a non-profit located in Durham, North Carolina, visited the Fairgrounds and planted raised garden beds, installed a bench, and even created soccer goals for the kids to enjoy. Their focus is on issues of environmental sustainability and community development. Their mission starts with advocating for local foods and renewable energy sources. To address such large topics they offer both expos and workshops to children and young adults from their retro-fitted school bus classroom. Their program directives can be divided into five major categories – Gardening, composting, alternative energies, nutrition and outdoor living. In just four days, the group installed this garden, complete with rain barrels. For more information, or to make donations, please visit the Fairground’s Tumblr: http://lb-fairgrounds.tumblr.com/ or like Little Berlin on Facebook. Little Berlin member Angela McQuillan has been overseeing this project. If you come out and walk through the neighborhood’s new garden- you are likely to see Mcquillan fully dressed for work, devotedly watering the plants on her lunchbreak! Exciting things to look for and to look forward to!